IOLAN SDG4 W Device Server: Wireless LAN (WiFi) client IEEE 802.11 a, b, g, n @ 2.4Ghz/5Ghz, 4 x RJ45 connectors with software selectable RS232/422/485 interface, 10/100/1000 Ethernet, advanced data encryption, user authentication and event management security features included, IPv6, COM port redirector, 15kv ESD, AC power adapter included. 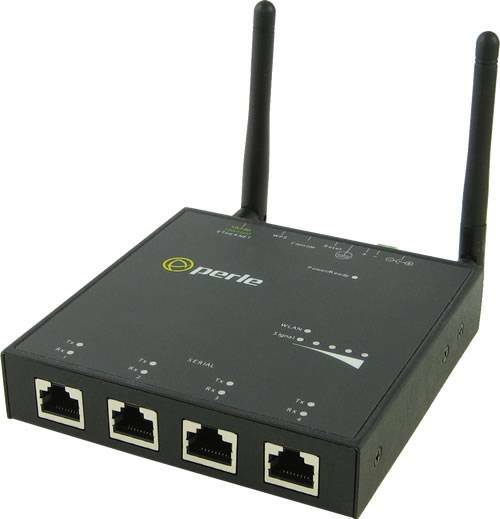 A Serial to Ethernet solution to easily connect devices with RS232, RS422 or RS485 serial interfaces to Ethernet LANs for access to network server applications. Ideal for applications that require authentic serial communications across a wireless LAN using Wireless Access Points (WAPs). For complete product details and technical specifications, please visit our IOLAN SDS W Device Server Product Page.